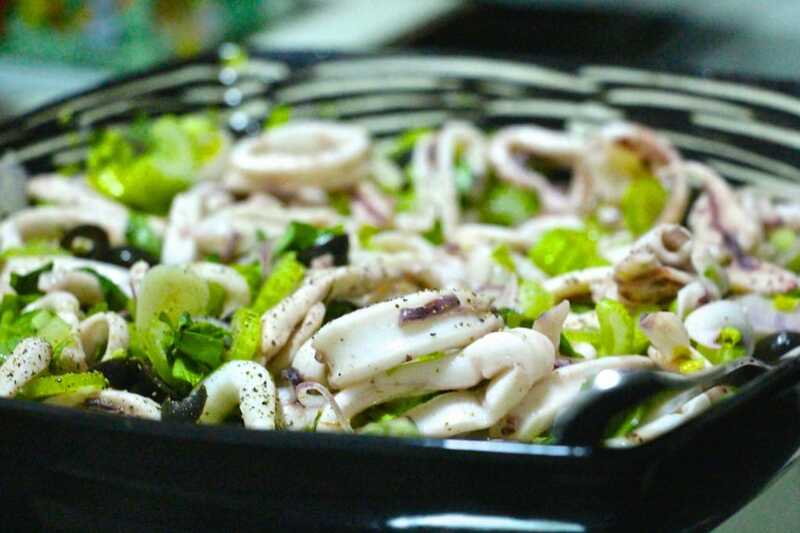 Squid salad with lemon basil and olives | Is Life a Recipe? This is a big salad. I served this at a wee gathering of people, and it easily coped with 6 adults and 4 kids. Of course there was load of other stuff too. If just serving this, I would say you could easily cover 4-6 people no problem. It’s big, it’s tasty, it looks impressive with all those colours. This is my Squid salad with lemon basil and olives. I think that would look rather good on any restaurant table, beautiful vibrant colours. Cut the squid to rings. Take it off the heat and set aside and let it cool. Have a taste – if you want more citrus just add in more lemon juice. You have finished the Squid salad with lemon basil and olives, my friends. It’s an easy one, but effective. You could also add a roughly chopped chili padi or two in there too as that would be an awesome match with the other ingredients. Up to you. A completely empty bowl was left on the table after the meal, which is always a good sign. This one really works, it is a superb salad that you should try, and if you do try – ENJOY!!! No Replies to "Squid salad with lemon basil and olives"